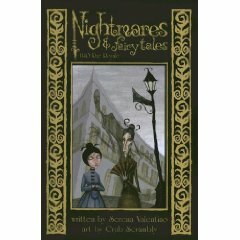 “Nightmares and Fairytales 3: Rue Royale” is a creepy little Gothic tale featuring a haunted house, a young woman tormented by spirits, and a bunch of monstrous nuns. Set in Victorian New Orleans, as all good ghost stories should be, it tells the tale of one young woman’s fight to regain her sanity and her life. Though somewhat derivative – most ghost stories are, after all – “Rue Royale” is quite a twisted little dark gem. It has some quite original features and a gripping story with some very nasty twists – the fate of one of the servants is enough to make you really wince. The artwork is good, very creepy (it reminded me a little of Roman Dirge) and fits the story very well. There are some nasty little surprises in the art if you look closely; watch what the nuns are doing behind the lead character’s back when she visits the nunnery… Though at some points the story does become a little convoluted, overall it’s a good book and an entertaining, if creepy, little read. Of course, it can trace its origins back further, as similar themes can be found in many classic Westerns and even stories set in the medieval era with wandering knights-errant. I mention this by way of saying that the basic scenario of Wasteland is familiar, but this is not necessarily a problem. It’s not whether the scenario is familiar, there being only around fifteen plots in the world, but whether the author has managed to do anything good with it. Happily, this author and artist have. I enjoyed Wasteland. I like a good action-adventure, especially if the author has successfully created characters which are neither annoyingly invincible, or just annoying. The main character, Michael, is mysterious without it being too contrived, and there’s a pleasing lack of sexism, with some strong female characters. The art is good, too – black and white and very clear, in a way that really suits the story. In a genre too often filled with men-in-tights filler, this is a welcome and refreshing addition to the world of graphic novels. 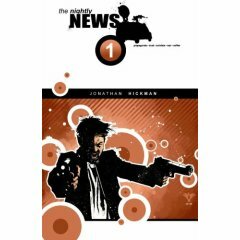 Both a tale of conspiracy and terrorism, and an rant against the state of news reporting in America, “The Nightly News” is a graphic novel unlike many others. Ostensibly, it’s about a man whose life was ruined by the television news – the Nightly News – and who joins a cult dedicated to bringing down those who work in it, killing news presenters and others working in the industry. At each turn, however, the author confronts us with various facts he’s collected on the state of the information industry in America in the form of endnotes. These are presented in the shape of numbers scattered through the book, which correspond to the endnotes at the end of the book. It’s an interesting way of presenting the book. You can either read it all the way through as a straight tale of one increasingly deranged man’s obsession as he becomes “The Hand” – the leader of the cause – or read the endnotes, which form an ongoing commentary on the events in the text. The only flaw with this is that the numbers are so small, it’s not always obvious that they are there. I was a third of the way into the book before I realised their existence. Wisely, the author does not shirk from showing us the violence and suffering caused by the Hand and his followers. Though the facts are often shocking, we aren’t tempted to view them as the good guys. Instead, the author asks us “If this isn’t the way to solve the problem, what is?” The artwork, too, is impressive and distinctive. My only complaint would be that the plot is a little convoluted. It may take a couple of goes to be sure you understand what’s going on. Then again, it makes a refreshing change to have to employ one’s brain to grasp what’s happening in a graphic novel; this isn’t mind-candy like so many others out there on the market. Recommended for anyone ready for a thought-provoking read who is willing to sit down and really get into it!